Reservations are welcome for two versions of Japanese Pokemon XY 3DS LL handhelds which ship in October 2013. 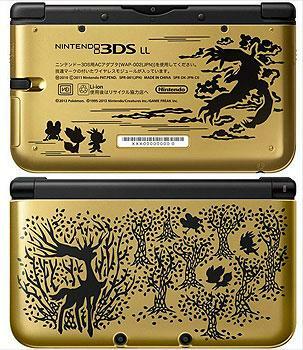 A blue-shell version featuring Xerneas and Yveltal on the front will sell through normal distribution channels at JPY22,800 or US$309 from NCS and a Pokemon Center exclusive gold-shell variant featuring Xerneas and the three starter Pokemon Fennekin, Froakie and Chespin on the cover which is on offer for US$399.90. Each handheld includes a 4GB game card which contains either Pokemon X or Pokemon Y (your choice).